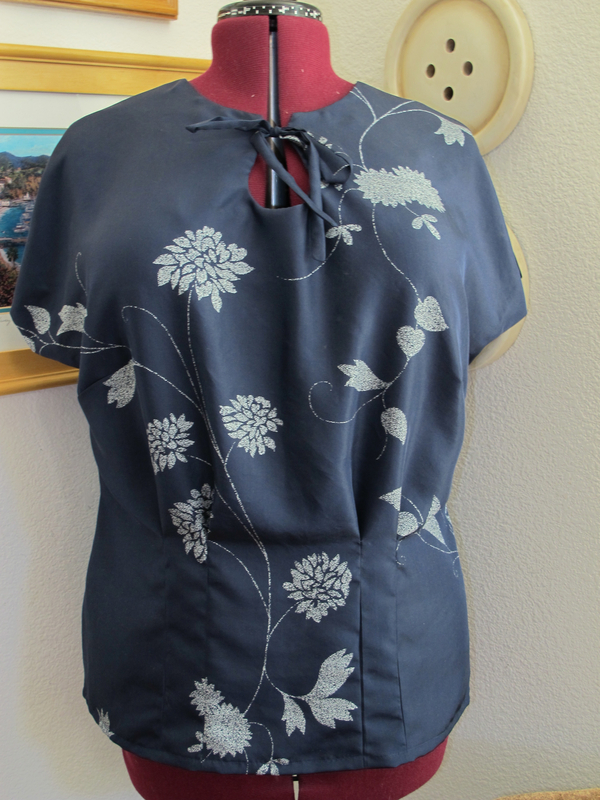 I finally finished the navy blue silk Sencha blouse that I started lo these many weeks ago. My first silk garment. With a pattern I altered quite a bit. And bust darts I created. The good news is I made my way through a veritable minefield of potential sewing mishaps and came out with a wearable blouse (though truth be told, it feels a little tight at the sleeve holes, not sure why). The bad news is I can’t wear it! Isn’t it pretty? I wish I could wear it. By the way, it fits me better than the dress form. You’ll just have to trust me for now. I have two pairs of navy pants that I wear regularly, and the Sencha silk blouse looks horrible with both. This is not Sencha’s fault. This is my fault. These pants are just not flattering with a top that must be tucked in. I always wear them with sweaters or knit tops outside that fall to mid hip, if not below. Neither pair is a great fit overall. So, the lovely Sencha silk has exposed a giant hole in my wardrobe: No flattering pants in navy, and no wearable navy skirts at all. A-line skirts are flattering, and I can make those in a hurry. I only have to fit them at the waist. The next item on the sewing agenda is a wearable muslin for new skirt pattern with a contour waistband. I also have the contour waistband pattern I created for the coral polka dot skirt. Either way, I’ll be able to make a navy skirt that looks good in no time. But pants? Oh, that’s a whole other story. In preparation for making pants some day, I bought Pati Palmer’s Pants for Real People. What was going to be a sewing project down the road has become somewhat of an emergency. I may just have to wear skirts for a while. Until then, no shot of me in Sencha silk. My dress form will have to do. The silk sewed beautifully — No snags (thanks to a brand new supply of silk pins and my policy of using a new needle for every project), and handsewing the sleeve facings with the catchstitch worked great. Nothing shows from the right side. I LOVE this stitch. And if feels so much more sturdy than a slip stitch. My pattern alterations actually worked — The bust dart and other changes I made helped the pattern fit beautifully. I wanted to interface the buttonhole area, so I merged the separate neck facing pattern with the center back self-facing and interfaced it all together. That worked as well. I’m not sure why the pattern isn’t set up that way, except maybe to save fabric on the pattern layout for larger sizes. Pinking is awesome — Because of the on-seam construction of the sleeves, which have self facings, I couldn’t use French seams anywhere. I chose pinking and straight stitching instead. Love the vintage look of pinking, although my pinking shears (gift from a friend’s mother, say, 25 years ago. Thanks, Mrs. Mailes!) need sharpening. I have found the perfect use for Clover Wonder Clips — They do a great job of holding a small double-fold hem in place before sewing. I only have 10 clips, which isn’t enough to do an entire hem all at once, so I will be buying more. The hand of the silk is a little stiff for my taste — even after machine washing and drying. I bought the yardage online. Oh, what I wouldn’t do for a decent garment fabric store nearby so I could feel before I buy. My automatic buttonholer failed me — The Fancy Damn Machine makes beautiful buttonholes but, sadly, not on silk. It just couldn’t move the fabric the way it needed to. I realized later that I probably could have done them on my Brother PE 700ii embroidery machine. Because the fabric is moved by a hoop, not feed dogs and a wheel, it has no choice but to move correctly. Thankfully, I followed my usual procedure and started with the buttonhole at the bottom (the one that would tuck in). When the first one didn’t work (twice!) I decided to sew on snaps. I was IN LOVE with the contrast buttons I picked out, so I sewed them on after the snaps, just offset enough that I could get the needle through, but the snap stitching doesn’t show. No one will know the difference. 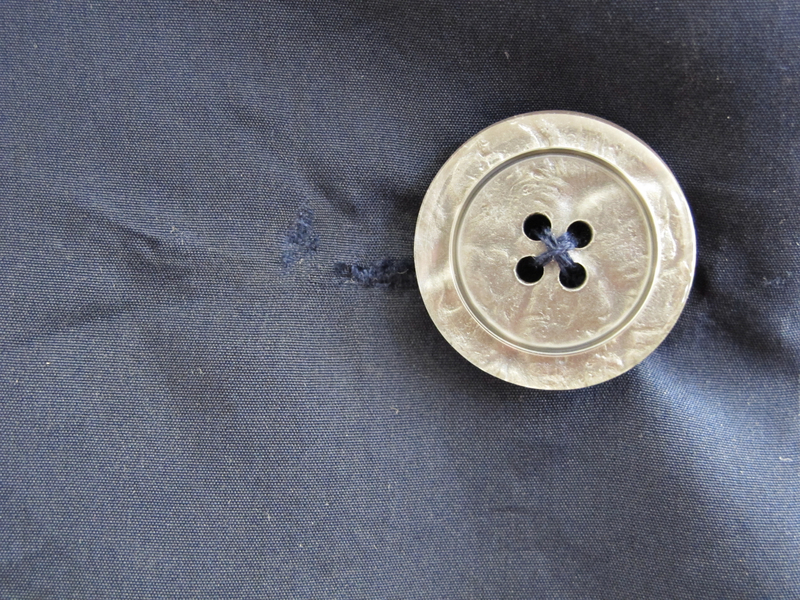 I was so happy with the way the slightly iridescent gray plastic buttons I picked out matched the gray design on the navy silk that I just had to use them. Even without buttonholes. If you look closely on the left, not only can you see the failed buttonhole, but also a rough patch in the silk where I ripped out some stitches. I decided the rest of the stitches would just have to stay where they were. I don’t even remember when I finished this project. It was sometime after Girl Scout Cookie season ended (I oversaw cookie sales for 93 troops) but before I left town for my company’s annual convention. I’m still catching up with life, but I can’t wait to do my next sewing project. Next up: A wearable muslin for a four-gore A-line skirt with a contour waistband. I’m going to want to add some pockets. It’s lovely! Silly question, but could you not wear it with a colour other than navy? 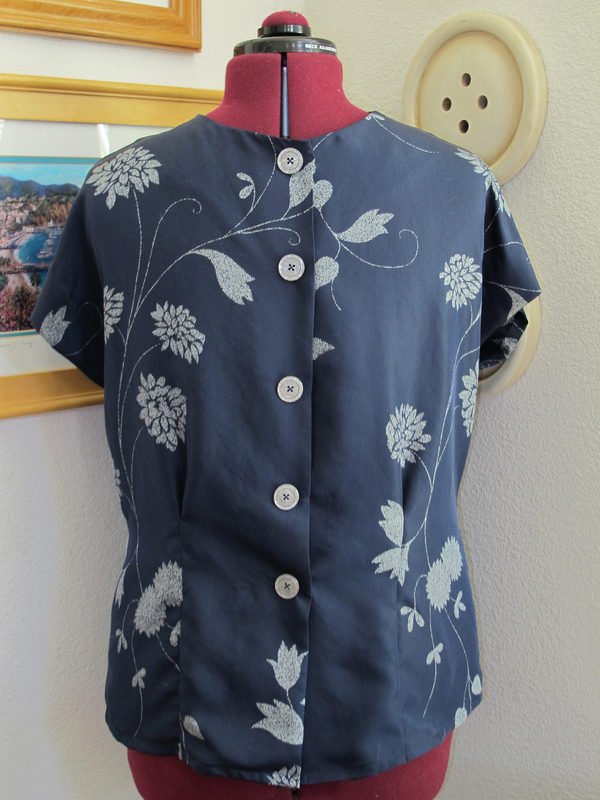 It would look stunning with a grey skirt of a similar colour to the buttons/silk. Thank you, Sarah! What a great thought, but alas, I have no gray skirt either. My next post will be about my 2012 sewing plan. I’m still working it out, but in a word: Separates! It’s amazing how much time and effort we spend making things and yet not thinking about the wardobe as a whole. I’m trying to do a sewing plan at the moment as well. I think I’m going the other way, if I’ve got dresses then it doesn’t have to match to anything! That’s a great solution, but I think I can only face fitting half my body at a time! I think I’ll do dresses next year.